Victory and Now Boxing Promotions’ prospects are staying busy in the new year. The promotions’ top prospect, Jaron “Boots” Ennis (17-0, 15KO) is back in action this Friday, January 26th in his hometown of Philadelphia. The 20 year old boxer, widely considered the best prospect in Philadelphia, will appear on the Real Deal Boxing card at Sugarhouse Casino. Brian Norman Jr., son of super middleweight Brian Norman (17-11, 5KO) of Atlanta, won in his professional debut in Houston on Saturday, and Christian Montano advanced to 4-0 (4KO) on the same card. All three fighters are managed by Cameron Dunkin and promoted by Chris Middendorf of Victory Boxing Promotions, and Joseph Dunkin of Now Boxing Promotions. Welterweight Brian Norman, Jr., who is trained by his father, dropped Kire Lucas (0-3) with a body shot before finishing him with another body shot in one minute, 31 seconds of the first round. 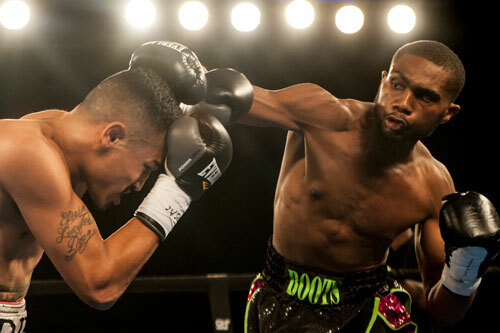 Montano also finished his opponent in the first round, stopping the experienced Keith Collins with a hook to the body, and straight right to the head at the 1:06 mark. This Friday, “Boots” will face rugged Mexico City talent Gustavo Garibay (13-9, 5KO), who is the Mexican Super Welterweight Champion, and is a former WBC Latino Super Welterweight Champion. It’s the second fight in the United States for Garibay, his last being a loss to Zhankosh Turarov (22-0, 15KO) in Boca Raton. Ennis, who trains with his father, former fighter Derrick “Bozy” Ennis in Philadelphia, last fought in December at the 2300 Arena, where he knocked out George Sosa inside of two rounds. The young pugilist is moving quickly, and fought nine times in 2017. Ennis is three months shy of his 21st birthday. Dunkin and Middendorf may not get him to 21 wins by his 21st birthday, but both feel certain that 2018 will be the real ‘coming out’ year for the young talent. Tickets for Friday’s event are available at Ticketmaster outlets and at therealdealboxing.com, and are priced at $125 and $50. Doors to The Real Deal Showcase Series I open at 6 p.m., and first bell is at 7 p.m.